Magazines – Who Wouldn’t Want More Rounds? 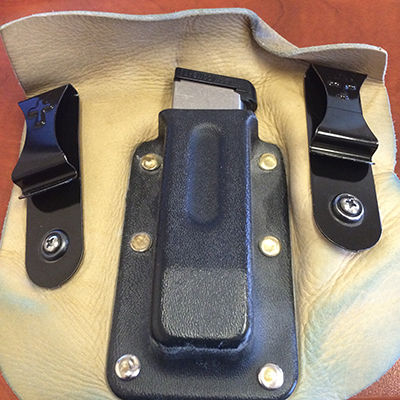 The magazines you use in your defensive firearm need to be tested with the same care you test your carry ammo. The first point of failure in a lot of guns is the magazine. Some manufacturers use third party magazines — some good, some not so good. For 1911s especially, I’ve learned to trust Wilson Combat Magazines so much that I rarely use a factory magazine. I don’t use them at all unless I’ve run a lot of rounds through them with no failures. When it comes to being prepared to meet with a threat, more rounds is better, right? But I like flush magazines in my 1911 when carrying and all of the eight round magazines I’ve gotten from Wilson and other manufacturers have had a baseplate. The Sig Sauer Scorpion Carry is a little different in that it has extended grips that surround the magazine baseplate making it almost flush. So with the Sig I have 9 rounds in the gun and eight more in the spare magazine I always carry. Oh, did I mention the spare? I guess not. Well, here it is over to the right and here you can see the Wilson Combat eight round magazine with it’s base plate. When not carrying the Sig, my usual capacity was eight in the gun and eight more on tap, because I’ve been using 7 round Wilson magazines without the extended base plate. Now things have changed. My most recent 1911 Commander acquisition is a Colt XSE and the Colt came with two eight round magazines, no extended baseplate. Interesting. I took the Colt and it’s magazines to the range and shot it a bunch with absolutely no issues. Then I shot the magazines in my other 1911 Commanders (Remington, Ruger, S&W) with the same results. 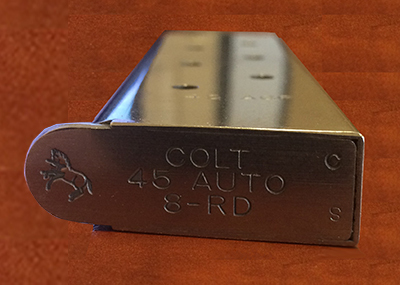 I checked Colt’s website and they had them in stock – Colt’s part number SP574001 for the Stainless Steel Version. They were out of the Blued ones, but when they’re back in stock I want a couple of those for my Remington. Colt sent them promptly and I’ve test the new ones in my carry guns. Now, I can still have a flush mount baseplate and 9 rounds on tap. I know, I know, with a .45 one round should be enough. Sayings like that are fine in the classroom or when just talking. But in the real world, you never know what you might encounter, so I try to prepare for worst case scenarios. Extra bullets aren’t very heavy. So, why am I into the flush magazine base plate? What difference does it make? Maybe not a lot, but take a look at these two photos. The one on the left is the S&W 1911 SCE with a Wilson 8-round magazine. 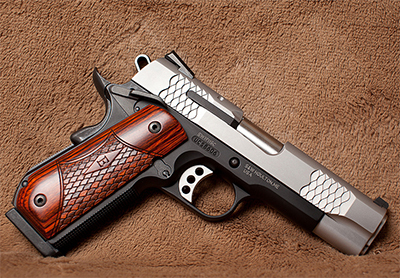 The one on the below is the same S&W 1911 SCE with a Colt 8-round magazine. See the difference? just a little less for your shirt to catch on, a little less in the way of a clean draw. Not a lot, but if you can do the little less and there is very little price difference, why wouldn’t you?